Six people in Los Angeles recall their misadventures from the previous night at a club. Ryan is the house DJ at a nightspot in Los Angeles that is enjoying a brief moment as the hippest joint in town. Ryan carries a torch for Cassie, a waitress who is hoping to launch a career as an actress. However, Cassie isn't as strongly attracted to Ryan, and she has no shortage of other potential suitors. 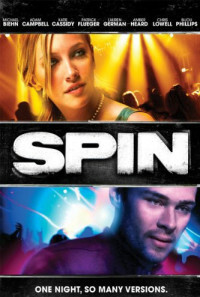 As Ryan and Cassie try to sort out their feelings during one busy night, a number of other folks looking either for new love or a new hook-up make their way across the dance floor, including Tony, who has been propping up his failing film industry career with some illegal business; crystal meth enthusiast Delaney; Mick, who works his British charm for all it's worth; and Aubrey and Apple, who are friends with Cassie and are also struggling to get a break in showbiz. Regions are unavailable for this movie. Click the "Watch on Netflix" button to find out if Spin is playing in your country.